Why did I read this book: I ADORED, The Hundred Thousand Kingdoms and it made my top 10 of 2010. I have wanted to read The Broken Kingdoms since it came out but kept putting it away because… I don’t have a reason. I am an idiot. Obviously. Warning: this review contains necessary spoilers for book 1 as well some minor spoilers for book 2. If you read book 1, you should be ok. The day I started reading The Broken Kingdoms was the day I did not go to bed at all. I’ve been really busy lately with Work and Real Life and my reading time has unfortunately suffered as a consequence: I always used to read till about midnight every day but these days this is a rare occurrence as I tend to kaput way before that. 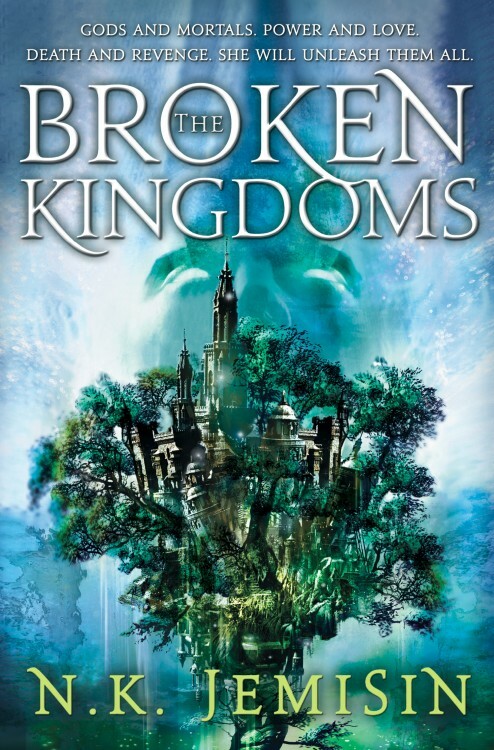 Enter The Broken Kingdoms, the sequel to The Hundred Thousand Kingdoms (one of my top 10 reads of 2010), A.K.A the book that has kept me awake until I was done reading it. Because it is FABULOUS and I loved it as much as I loved its predecessor and that is no mean feat given how that book blew my mind away. It’s been ten years since the events at the end of The Hundred Thousand Kingdoms. The world and its people are still in the process of understanding what exactly happened that day when a God fell, another was freed and a Goddess was reborn. How exactly those events affect the political system that kept the Thousand Kingdoms under the rule of the Arameri (the Human family that held the power of Gods) and the religious system that sustained everything is still left to be seen. Because the cohesiveness of the Hundred Thousand Kingdoms is effectively broken: the Arameri have lost most of their power and Kingdoms are regaining their freedom and starting to stand on their own feet; the one Order that worshiped Bright Itempas, the One God that ruled them all, started to lose its importance just as other Gods – major and minor – have come back and entered the worshipping roster. In a smaller scale, people are minding their own business around the city. Oree, the narrator of this book, is a blind artist (she can’t see with her eyes, but she can see with her magic) trying to make her living but having a hard time staying away from Gods and Godlings’s business – she is, as per her own words, a woman plagued by Gods. The former lover of Madding, a minor Godling whom she still has strong (reciprocated) feelings for and friends with a strange figure that turned up at a rubbish bin near her house and who she ended up inviting to stay over. This bloke whom she calls Shiny for his ability to shine when the sun is rising, speaks very little and dies a lot only to resuscitate almost immediately. If you read the previous book, you will know who that is – and why he is the way he is. Oree doesn’t – at least not to start with – and part of the fun of this book is to see how long it will take her to figure out who he really is. Speaking of fun, please allow me an aside: oh, the cameos. I loved them. The real plot kicks-in when Oree comes across a dead Godling, something that should have been an impossibility as only other Gods could ever have the power to do something like this. This whodunit is part of a larger plot that has to do with religious fanatics and political factions which in turn has to do with the even larger question of identity, of the relationship between Gods and Humans and ultimately the power balance between the three major Gods of this pantheon. And it is in this combination of the small scale and the big picture that lays the excellence of this series. Oree is the main protagonist of this novel and the murder-mystery the moving force of the plot but they are not the centre of this universe – no, the central aspect of these novels are the three gods and their relationship with each other and with the universe at large. How they balance each other (or not), how their presence and/or absence influence the universe and how their relationship with puny humans have consequences. This is fascinating because it is so well played out by the author. She somehow manages to make Oree important even as it is more than clear that her importance is a fleeting thing. She is after all, mortal, nothing but a blink in time in contrast to Gods and forces that are basically…eternal. She is important because she matters to the people who know her- like any other person in the world (ok, so perhaps she matters just a little bit more in the end given her heritage but still). Her narrative is awesome. Granted: it is not as spectacular as the one in the previous book but I have yet to find a narrative that engaged me so much as Yeine’s – all the backs and forths were exactly what I loved the most about that book. Yeine’s narrative was spectacular because it was grand, tense and urgent. Oree’s is less so, it is more friendly, focused and intimate – almost like a conversation. In fact, yes, it feels as though Oree is conversing with the reader (the truth is something else entirely but not that far from this. How is that for cryptic?). Because of this sense of intimacy, I felt her fear, her love, her chagrin, her grief, her isolation and loneliness as well as her fierceness and I loved her. One of my favourite scenes is when Shiny tells his side of his story and although I felt for him a (small. Very, very small) degree of sympathy, I was more interested in hearing how Oree was relaying his story, how she felt about it and how she reacted to it. There is a great examination of how meaningful regret – even true, heartfelt regret – is in face of terrible acts. And how cool was it to see her, as a blind painter, understanding and examining the nature of Light? Although there are themes such as identity, freedom, humans x Gods (not to mention, of course the overarching story of the three Gods) that connect The Hundred Thousand Kingdoms and The Broken Kingdoms, the two books are very different. I would say that The Broken Kingdoms is less dramatic and is more thoughtful and quiet than its predecessor. It is SO sad and has an extremely bittersweet (emphasis on the bitter) yet fitting and therefore, perfect ending. It would have made my top 10 last year had I read it in time and I have been beating myself up for waiting this long to read it. I will not make the same mistake with the last book, The Kingdom of Gods. It is on my nightstand staring at me – I predict another sleepless night. And I welcome it. I remember that it was midmorning. Gardening was my favorite task of the day. I’d had to fight for it, because my mother’s terraces were famous throughout the territory and she didn’t quite trust me with them. I couldn’t really blame her; my father still laughed over whatever I’d done to the laundry that one time I tried. Gardening, however, was not one of those things. It was the weeding that my mother feared, because many of the weeds that grew in Nimaro were similar in form to her most prized herbs. Fakefern had a fan-shaped frond just like sweet ire; running may was spiky and stung the fingers, same as ocherine. But the weeds and the herbs didn’t smell anything alike, so I never understood why she had such trouble with them. On the rare occasions that both scent and feel stumped me, all I had to do was touch a leaf-edge to my lips, or brush my hand through the leaves to hear the way they settled into place, and I would know. Eventually Mama had to admit that I hadn’t tossed out a single good plant all season. I was planning to ask for my own terrace the following year. I usually lost myself in the gardens for hours, but one morning something was different. I noticed it almost the moment I left the house: a strange, tinny flatness to the air. A pent-breath tension. By the time the storms began, I had forgotten the weeds and sat up, instinctively orienting on the sky. What I saw, in what I would later learn to call the distance, were vast, shapeless blotches of darkness limned in power. As I gaped, great spearing shapes — so bright they hurt my eyes, something that had never happened before — jutted forth to shatter the blotches. But the remnants of the dark blotches became something else, darting liquid tendrils that wrapped about the spears and swallowed them. The light changed too, becoming spinning discs, razor-sharp, to cut the tendrils. And so on, back and forth, dark against light, neither winning for more than an instant. Through it all, I heard sounds like thunder, though there was no scent of rain. Others saw it too. I heard them coming out of their houses and shops to murmur and exclaim. No one was really afraid, though. The strangeness was all up in the sky, too far above our very earthly lives to matter. So no one else noticed what I did, as I knelt there with my fingers still sunk in the dirt. A tremor in the earth. No, not quite a tremor; it was that tension I’d felt before, that pent feeling. It hadn’t been in the sky at all. I sprang to my feet and grabbed my walking-stick, hurrying for the house. My father was out at the market, but my mother was home, and if some sort of earthquake was in the offing, I needed to warn her. I ran up the porch-steps and yanked open the rickety old door, shouting for her to come out, and hurry. But then I heard it coming, no longer confined to the earth, rolling across the land from the northwest — the direction of Sky, the Arameri city. Someone’s singing, I thought at first. Not one someone but many; a thousand voices, a million, all vibrating and echoing together. The song itself was barely intelligible, its lyrics a single word — yet so powerful was that word that the whole world shook with its iminent force. The word that it sang was, grow. You must understand. I have always been able to see magic, but Nimaro had been mostly dark to me until then. It was a placid country full of sleepy little towns and villages, of which mine was no exception. Magic was a thing of the cities. I got to see it only every once in awhile, and then always in secret. But now there was light and color. It burst across the ground and the street, traced up every leaf and blade of grass and paving-stone and wooden slat around the front yard. So much! I had never realized there was so much to the world, right there around me. The magic washed the walls with texture and lines so that I could see the house where I’d been born for the first time in my life. It outlined the trees around me, and the old horse-cart around the side of the house — I couldn’t figure out what that was at first — and the people who stood in the street with mouths hanging open. I saw it all — truly saw, as others did. Maybe more than they did, I don’t know. But it is a moment I will hold in my heart forever: the return of something glorious. The reforging of something long broken. The rebirth of life itself. That evening, I learned my father was dead. One month after that, I set out for the city of Sky to start my own new life. Completely agree! I liked The Hundred Thousand Kingdoms enough to pick this one up, but The Broken Kingdoms really impressed me. And Oree is everything a first person narrator should be. i love this book. nk jemisin is piles of awesome, and it looks like she’ll be pumping out the books at a pretty steady rate for the forseeable future — and that is fabulous news for everyone! you should definitely pick up “the kingdom of gods”, book 3 of the inheritance trilogy. i’m about a third into in and am very much enjoying it so far. I’ve been putting off reading the second book in the trilogy as well for no reason lol. But now it is my next to-read book. You know, *I* have been putting off this one too and I have no idea why! Thank you for the nudge in the right direction Ana – and I have to say I am so thrilled this is as fantastic as I hoped.